Valve train parts for the "top end" of your engine. Push Rod Tubes and Parts such as seals etc. 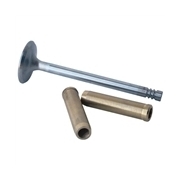 Rocker kits and parts including solid shaft kits, complete bolt on rocker kits and parts.